Accor – Newsroom | Kidding around at Raffles Hotels & Resorts. Kidding around at Raffles Hotels & Resorts. PARIS, January 2017 – Global citizens are not born; they are made, thanks to the foresight of wise, generous and well-traveled parents. Yet trips with kids inevitably require extra effort to plan and carry out. Fortunately, Raffles Hotels & Resorts has long sought to welcome guests of all ages and has made thoughtful arrangements at each luxurious location to ensure an easy, delightful and heartwarming experience for every member of the family. With activities designed to encourage discovery, learning and active play, children are free to be children, while feeling cared for, understood and valued. Parents will appreciate a carefree holiday where they can cherish every minute with their adventurous, culturally aware, and youthful globetrotters. Learn to be eco-conscious in the Seychelles. Working with Seychelles National Parks Authority (SNPA), Raffles Seychelles has developed an exclusive program that brings eco-tourism to life with the country’s very own custodian and nature protector - the park ranger. Ranger for a Day and Junior Ranger for a Day provide budding conservationists with ‘behind the scenes’ access to otherwise inaccessible areas on Curieuse Island. Children will tour the nature reserve to see giant tortoises, tropical birds, turtles, lush green mangroves, Coco de Mer palms and other flora and fauna species only found in the Seychelles. Part of the proceeds from this program are donated towards safeguarding the delicate ecosystem of the Seychelles through the tireless efforts of the SNPA. Discover French fashion, food and art in Paris. With a dedicated Kids’ Manager in-house at Le Royal Monceau – Raffles Paris, the interests of pint-sized guests are never overlooked. An inspiring program called Le Petit Royal includes daily breakfast at the hotel’s gourmet restaurant, La Cuisine. Children are also invited to attend creativity workshops led by Les ateliers de Macha, presented in themes linked to current art exhibitions in Paris, helping children to learn more about specific artists and artistic styles. Young guests will also receive welcome amenities designed by French children’s wear couture house BONPOINT, including a plush kitten named ‘Royal’ – an adorable companion for each child during their stay and a memento of their stay at the Parisian palace once they return home. Double the fun in Cambodia. Raffles has not one, but two, wonderful properties in Cambodia with amenities that children will love. At Raffles Hotel Le Royal in Phnom Penh, kids can have a wonderfully relaxing holiday, swimming in the resort’s two pools, watching their favorite movies and joining in the spirited activities of the on-property playroom. In Siem Reap, Raffles Grand Hotel d’Angkor is one of the historic hotels of the legendary Grand Tour of Indochina. The hotel sits across from the Royal Palace and is just 10 minutes away from a UNESCO World Heritage site. Children will love playing among the 15 acres of beautifully landscaped French gardens, swimming in the country’s largest pool and challenging their parents to tennis matches. Family-style villas are kitted out with fully-equipped game console systems and both hotels offer babysitting services, kid-friendly menus, and baby cots. Go to camp on Hainan Island. Located on one of the finest beaches by the South China Sea, Raffles Hainan offers beachside relaxation, luxurious comfort, fun family activities and unique cultural discoveries. The Raffles Hainan Family Concierge is on hand to arrange everything from dinner reservations to ambitious activities, such as family cooking classes at Sapori Restaurant or family yoga classes on the beach. 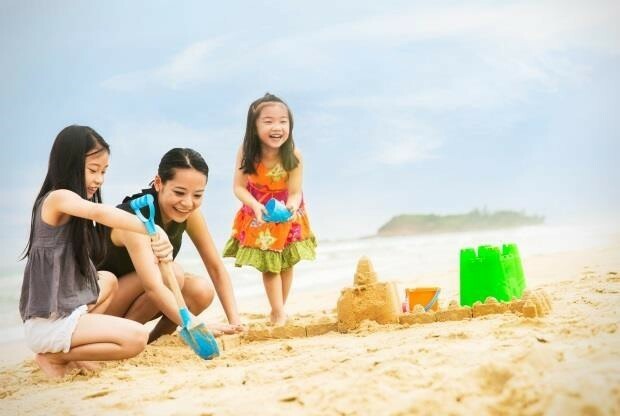 Children revel in their own space at the Raffles Rascals Kid’s Club or full-day fun at Raffles Kids’ Camp, while the grown-ups enjoy golfing, cycling, tennis beach volleyball, beach football, or the heavenly treatments at Raffles Spa. In the evening, families can relax in the comfort of their own spacious villas, complete with private pool and garden, where they can enjoy their own family barbecue or hot pot under the stars. Become a member in Turkey. With family friendly services, amenities and activities, Raffles Istanbul is designed to make a family’s stay an unforgettable experience. When parents and kids are ready for a break from each other, children head to the Kids Club, a no-parents zone where experienced instructors engage kids in creative activities such as face painting, jewelry, postcard or hat making. It’s the Kids Membership, however, that keeps the little ones coming back for more. With special benefits such as free beverages on the first stay, free kids menu on the second stay and a bathrobe with their very own embroidered initials on the third visit, children will get excited about earning their next reward. All children enrolled into the program receive personalized membership cards, for that official, grown-up touch. Get a passport in Singapore. The Raffles Generations package is the perfect opportunity for families to write a new chapter in their book of memories. Families visiting Raffles Singapore will appreciate suites with double queen beds and connecting doors. Each little guest receives an Adventure Passport - a guide book that opens the doors to a journey of discovery at this historic hotel. Children can choose from a range of activities including making pizza and mocktails under the expert tutelage of hotel chefs and mixologists. Unique amenities and toiletries are specially selected by the Raffles Butlers according to each child’s age and might include items such as sweet plush toys, games and activity packs. The concierge team will also create customized itineraries for sightseeing in Singapore, depending on the family’s interests. Bring the grandparents to Manila. The luxurious Raffles Makati has created a special package designed to entertain three generations of family with a rich experience of the arts, history of the Filipino culture and a taste of the countryside. Guests will receive tickets to the educational Mind Museum; the contemporary Ayala Museum; and a day-trip to the family-themed Sta. Elena Fun Farm, which will include a charming picnic lunch among the animals, water-activities and fun on the zip-line. The family will enjoy a sumptuous Raffles suite complete with bespoke butler service, buffet breakfast, classic afternoon tea and evening cocktails at the iconic Writers Bar. The best part? If the family happens to extend, a second suite for two is available at half price. Take it easy in Indonesia. Children will feel right at home at Raffles Jakarta when they receive their welcome milk and cookies, climb around the bright and colorful kids’ playground, take a dip in the dedicated kids’ pool, run around the rooftop garden and then check in for some arts and crafts at the Kids’ Club. By the time parents are introduced to their 24-hour personal butler, it’s possible no one in the family will ever want to leave. Fortunately, the multi-generational travel offer means bringing the whole family to Raffles Jakarta gets even easier with value-added rates on suites and extra rooms.